We are (vicariously) parents again! Bunny Lapine, our resident permaculture doe rabbit, had been put to the same buck twice but “Pan Pan” (a pet rabbit belonging to 6 year old neighbour Camille) though very energetic in executing his duty … is firing blanks. 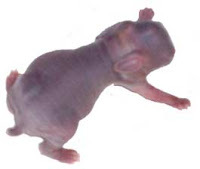 Rabbit gestation is a month and so several weeks passed while we fruitlessly looked for signs of pregnancy. Trying to dig holes in her run and pulling out her own hair to line the nest are guides but what we now know is that we should have put her back with the buck a week later and if she again accepts the amorous advances of bunny lurve then she’s not pregnant but if she wants nothing to do with the buck she’s probably is. Solange, an elderly neighbour, offered us the opportunity to try her buck, which we took. We decided not to return bunny to him a week later (as described) as, with winter approaching, if she wasn't pregnant, we would leave it until next spring to try again. Giving bunny her greens and hard food yesterday, Gabrielle thought to look in her nest to see if it needed anything (a clean, more hay, etc.) And, deep in a round nest of hay, is a ball of fluff that’s moving. We’re not sure how many there are as they will be blind and hairless and are better left wrapped up warm in their mother’s hairball. We also shouldn’t leave our smell on the babies, which could apparently provoke the doe to eat her own young. It’s exciting but we shall refrain from looking again and just make sure she has plenty of water, food and fresh hay. 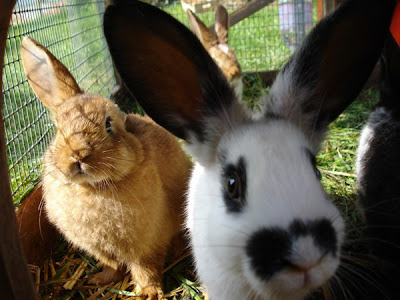 The photo of the day old rabbit is from the Internet and the one at the top, is of our bunny (the brown one on the left) as a youngster. Your Comments: we really enjoy receiving your comments, which range widely from, Manderine’s “Your blog is a great source of inspiration, as I am contemplating a leap of faith not unlike yours (in southwest Aveyron) starting right now …” through Renée’s comparing of homemade hayracks for small sheep, to Monica’s expert advice from the USA on how to gain experience in monitoring the size of sheep through their thick coats. Please feel free to post a comment by clicking on “_comments” below each post and follow the instructions and a big thank you to everyone who already has. Yum! How long before I get invited round for a rabbit pie?